Homepage. This page: Original paint to suit 1950s Austins. I passed my driving test in an old Austin (an A40 Mk1) back in 1987, and still own the car today - albeit not in a roadworthy state!! 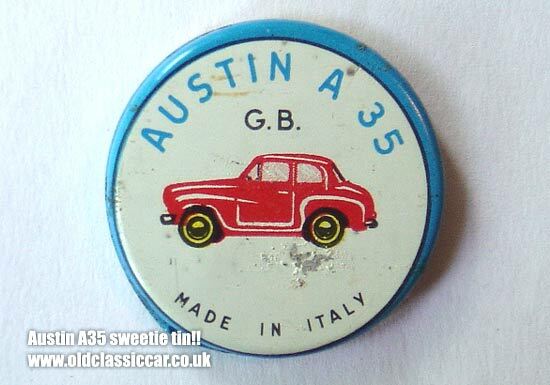 Austins have therefore always been of interest to me, and I continually look out for Austin memorabilia while searching for old-car collectables in general. The first photograph shows a pair of original touch up paints, as sold by Austin (BMC) dealerships in the 1950s. I know these are genuine, because I found the kicking around the floor of a battered A35 in a Stockport scrapyard, some years ago. Two different shades of grey are shown here (curiously the car I found them in was black). The darker colour, is Tweed Grey and is the better of the two. The other paint is Chelsea Grey. I assume these paints were available for all the Austin cars of the 50s, including the A30, A35, and the larger Counties cars (A40 Devon, Dorset, Somerset, A70 Hereford, Hampshire). The BMC touch-up paints were actually produced by a company called D.J. (Tipon) Ltd, thats according to the small print anyway. If anyone has other touch-up cans in different colours, I'd be interested to show them on here please!! I'll buy anything! This little tin, which measures just 1.25" in diameter, was found in an antiques shop, one of two such tins I think I bought (I'm not sure where the other one is!). Cheap little things like this were never meant to last, so consequently become quite rare items some 50 years or so later. Weird old ephemera therefore appeals a lot to me, and this little sweetie tin, which still contains some liquorice type sweets, caught my eye. They were made in Italy, and has the following stamped on the base - 'Menozzi Liquirizia - Montesilvano PE'. I assume these date to the 1950s, or perhaps a little later. If full size A35s are more your thing, and you'd like to buy one, there is a buyers guide elsewhere on the site which may be of interest.